Here it comes to you once more. Craigslist finds #2 and this time around it is still good, people. Real good! I am so excited to share with you my current aquisitons from craigslist, the magical quicker, picker, upper of the vintage finds. Ha, it is not just Bounty. I've been very patient and you know what they say, "all good things come to those who wait". Well, that's exactly my case. I have 5 new things sitting in my brother's living room since the last time I first introduced to you Craigslist Finds #1. The most recent being a marble coffee table, (which I briefly introduced HERE) marble side table, marble console table (ufff, that's a lot of marble, no?) a french Louis XV chair and finally a very cool sculpture of a ferris wheel. OH MY GOD! I can't even describe with intricate detail my absolute LOVE for all of these items. There just aren't enough words in the universe to satisfy me right now. Lets start first with the ferris wheel sculpture, shall we? That's the most random and coolest. I found this awesomeness on craigslist back in 2015 ( as most of the items to be discussed today) and immediately I was very intrigued by the unexpected sculpture. It was listed for $80 and although it was more than I was hoping to pay (it always is, isn't it?) I quickly emailed the seller and received a response stating it was still available. "Yay", I thought. Check out the actual listing below. After much back and forth between the seller and I we agreed on a pick up day/ time here in NYC even though the piece was staying in Long Island. When the day arrived to pick up the sculpture, the man messaged me saying something like "hey, one of the seats popped off slightly on one of the sides while I was transporting it so I'll let you have it for $20. You can probably glue or solder it back on since you're an artist and into DIY projects". I tried to sound the least excited or concerned about the broken seat in my reply, but you know I was literally jumping up and down from happiness because I had just scored such a wonderful sculpture at an incredible price. I made my way to the lobby of his building that night on 42nd street in Manhattan and when I saw that man holding that MASSIVE sculpture I couldn't believe my eyes. It was bigger than what I had anticipated. The bag I had brought along to store the piece in while I was on the train was way too small to fit it in because I thought the sculpture would be smaller, somewhere around 10 inches high. Nope, I was wrong. It measures 23 inches tall, this beauty. The entire thing is made from strong metal and a beautiful, solid piece of wood for the base. WOW! The best part and the part that gets me every time I see it is that it is 100% in working order. This ferris wheel revolves around like his daddy back at the carnival, round and round. Another thing that came as a surprise to me because I was almost certain the wheel was stationary for some reason. Why would I think that? It is a ferris wheel after all so it is meant to move. DUH! Well, in my defense, the seller didn't specify much about the sculpture to begin with on his listing. Oh, and that broken seat is not even noticeable at all. The man happened to tape it back together to the frame temporarily and till this day it is still like that. Next up, we have the side table. 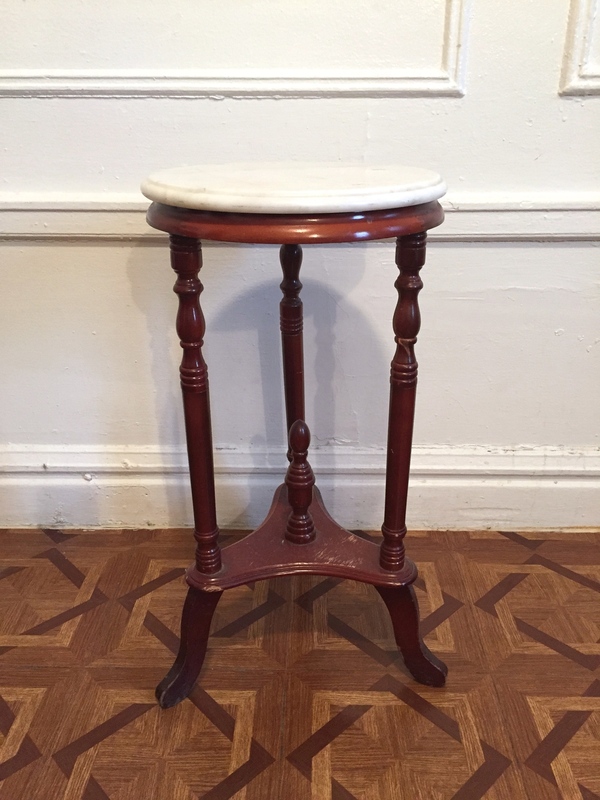 Found her for $20 and while I wasn't crazy about the wooden base with spindle legs I knew I could change that reddish, ugly stain with paint, a different stain after stripping the old finish or by completely getting rid of the legs, not the wooden surround on the marble since I actually like that. What I really want is to attach a brass base to the wooden surround, now, that would be hot. Uhhh, what's that post in the middle? Seeing as this table is clearly an antique I'm sure it had a use back in the day but I can't figure out what it was. I am mainly smitten with the marble top as any reasonable person would, no? Unfortunately, when I went to pick it up I noticed a slight chip to the bottom of the marble as well as a yellow, round stain on its surface. I almost didn't even want it when I saw that because the seller never mentioned any of these things on the ad or when I asked about the condition of the marble top since that's what I cared about the most. But, I held my horses and payed for it, anyways. One because the chip is not big at all, or incredibly noticeable since it is at the bottom and two I knew the stain could come off with the help of some home remedies. I told myself "marble is expensive and this man is practically gifting me a beautiful piece of beveled, round marble with a solid wood base (ugly, but still solid wood)". What's not to appreciate in this equation? My beautiful, and I mean stunning, gorgeous, (ahh, still not enough words to satisfy me right now) console table is the definition of my dream marble console table. For weeks I had been drooling over the ones sold at West Elm but those cuties are ridiculously expensive so when I found mine I couldn't reply to the seller's email fast enough. She is just so perfect and the price wasn't bad either at $175 for a real, vintage, mid century modern marble console table with original brass hardware AND two storage drawers to go along with the package. I mean, who am I kidding? The price is a steal. I almost feel like I payed a penny for it considering these things can cost hundreds of dollars. Why would anyone want to get rid of this? I cannot stress enough how perfect the marble top is. No chips, cracks, indentations, nothing. Everything looks great and it is truly the smoothest, shiniest piece of marble I have ever felt and seen (it almost looks transparent, like glass). I love the rounded edges on it and the vivid, meandering veins throughout. Specially those darker, gray ones. Wow, loads of personality on this stone, hey? That above is the photo the seller posted on craigslist with his listing. Now, yet another marble top. I must say this coffee table was a real struck of luck for me since I was never actually looking for one (received her back on March 18, 2016). I've seen several examples on Pinterest of how beautiful they look when styled and placed in a living room so I knew I always wanted one for the future. Not only did I get it for FREE, plus the $150 I had to pay a moving company to deliver it to me, but its size is incredible. It is truly very large and spacious (53 1/2L X 20D X 18H) while the oval shape is a great alternative for smaller spaces. Ya'll know we have loads of those here in NYC so in my future apartment that may or may not be a shoe box, (HA!) I know this table will fit nicely in there. I really love the beveled edge and the wooden shelf on the bottom for displaying some extra cute things. Like the round marble side table, I have special plans for this coffee table. I am seeing her sporting a gorgeous brass base, maybe, and lightening up the wood a bit with a softer toned stain such a weathered oak or whitewashed oak. I want to dedicate a separate post to this table so that I may show you all of her distinct attributes and my plans for it. With this one, I saw the fairies of beautiful antique french furniture congratulate me when I first laid hands on this gorgeous chair. They were flying all over, sprinkling their magical and glistening fairy dust on me, yep. A tad bit too fairy tale like for you? This chair is just so incredibly perfect with its intricate carvings, sturdy, strong and solid wood frame. And although it is clearly a french style chair, it could work in a modern environment because of the rigid structure. It is not too ornate. Wow! I am still in awe each time I see it. To say that when the previous owner delivered it to me he literally had the look of sadness and "why the heck am I selling this?" face as he handed it over. Literally. He sold it to me for $75 and delivered it free of charge. Another sweet man, he was, hey? When I buy something off of craigslist I always ask the seller if they can deliver since we don't have a car yet and I've been very fortunate to meet people willing to do so. He mentioned he wanted his daughter to keep it initially but that she wasn't into antiques or french chairs in general so she passed it up. He also said he would have kept it himself if it wasn't for the fact these chairs look and work best in 'girly' spaces. Heheheh. I can totally see where he's getting that idea from. The seat on this chair is quite spacious too and I don't feel at all confined by the arms. Like the rest of my finds, this beauty will get a complete makeover, so new upholstery, (I am loving the look of velvet these days) a lighter, weathered/whitewash oak stain after I strip the old finish and even a comfortable down filled cushion for the seat (this is a must). I am planning to use her as a desk chair in an office space at the future apartment so she must be very comfy. Right now she is stuffed with straw or wood shavings and I know this because I can feel the texture underneath the thick upholstery and my bum when I sit. The fabric? Although nice, is not what I am envisioning she look like in my decorated living room. I will ask they save me this fabric when I send her to the upholsterer because it is very great quality and I would hate to trash it. Oh, and the amazing craftsmanship of the carvings. The ornamentation (apparently the term used for the carving on the top) is very gorgeous and unlike anything I've seen before (not that I've seen many french chairs, to begin with). So there you have it. 5 outstanding pieces of newly acquired Craigslist finds. I love them all so much and hopefully you too can see the potential in all of them. I am more than sure they will look even more beautiful once they go through their much needed makeover. Note that for now, I think I am set with furniture pieces made back in the 1800s and 1900s because to balance the look of my future home, I need to incorporate some modern pieces too. I am hoping to improve their look with some modern touches like the lighter wood stain and the brass bases for both the side and coffee table.